How do I describe Laurie Anderson’s ‘Heart of a Dog’? Merely calling it a documentary would be grave injustice to the art that it is. A deeply personal reflection on love, loss and death, Heart of a dog follows a lucid dream like trajectory and remains bittersweet till the rolling credits, like life itself. Inspired by the memory of her beloved dog Lolabelle, whom Laurie and her husband musician Lou Reed adopted years before, the film meanders to be so much more than a homage. Laurie Anderson’s first feature film in nearly 30 years, Heart of a dog breaks free from the defined structures of story, it is but made up of the storyteller’s dreams and memories. Perhaps it is to be admired in solitude, between the heart and the soul. It is indeed poetry, a lyrical essay of sorts on the pain of bereavement, punctuated with a motley of paintings, 8-mm archive footage (from Laurie’s childhood) and that bourbon-smooth soothing voice over. And by the time screen reads David Foster Wallace’s quote “Every love story is a ghost story,” you can’t help but nod your head in acknowledgement. Set in the post 9/11 world, Heart of a dog follows the despair and desolation of our times– the most poignant chapter being when during a leisurely walk a hawk makes a dive for Lolabelle compelling the dog to henceforth be on the vigil that threat can come from the sky too! A poignant parallel to the paranoia of New York citizens in the aftermath of terror attacks. too, is embarking on such a trail as I write. There are beautiful imageries in heart of a dog, like the sequences in which the story, if I may call it so, unfolds via a rain-adorned glass frame. And it is not all about death either. 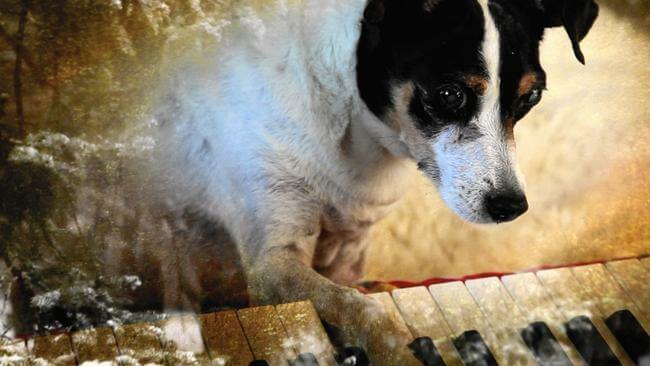 It embraces the joy of a blind dog playing the piano. Yes, an old dog can learn new tricks! The narrative also takes on the film maker’s relationship to her dying mother whom she could never love, offering a glimpse as honest as any to an artist’s mind. “You get your story and you hold onto it, and every time you tell it, you forget it more,” says Laurie reminiscing her childhood ordeal at the hospital where other, sicker kids screamed through the night and disappeared by morning. How we forget our story by focusing on chapters only our own? Perhaps this is what love is, time. Posted on June 7, 2016 Author Abhishek JoshiCategories Dogged reviews! Previous Previous post: 10 awesome ways to exercise with your dog!